Ever since Nicaragua brought a case against Colombia to the International Court of Justice (ICJ) in 2016, entitled: “Question of the Delimitation of the Continental Shelf between Nicaragua and Colombia beyond 200 M from the Nicaragua Coast,” the Court has been faced with the question of whether or not there is a hierarchy to continental shelf claims. In other words, would a coastal State’s 200 nautical mile (M) exclusive economic zone (EEZ) entitlement to the continental shelf and superjacent waters under Part V of UNCLOS prevail over an opposing coastal State’s claim to an extended continental shelf under Part VI? The former being based on a legal entitlement of all coastal States and the latter based on a geomorphologic claim by a coastal State that its shelf satisfies the stipulations set out in Part VI of UNCLOS beyond 200 M, which must be subsequently reviewed and approved by the Commission on the Limits of the Continental Shelf (CLCS). 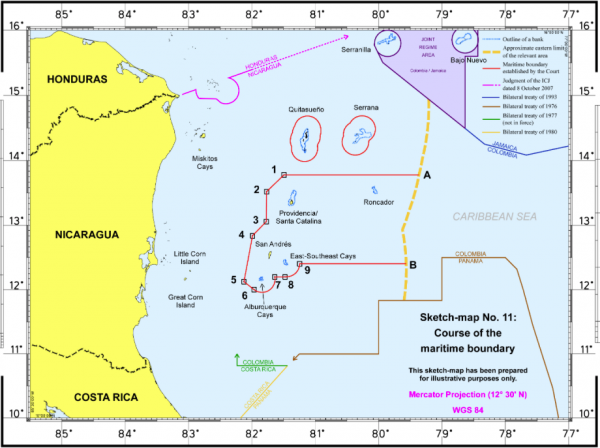 In its 2012 Judgment on the maritime boundary between these two States, the ICJ loosely defined the 200 M seaward limit of Nicaragua’s EEZ entitlement as the “approximate eastern limit of the relevant area,” but stated that Nicaragua had “not established that it has a continental margin that extends far enough to overlap with Colombia’s 200-nautical-mile entitlement to the continental shelf, measured from Colombia’s mainland coast. . . .” This new case is Nicaragua’s attempt to recast its scientific findings in hopes of convincing the Court that it has an entitlement to the continental shelf beyond 200 M from its baselines. Assuming for a moment that Nicaragua’s claim to an extended continental shelf in the western Caribbean Sea were to be upheld, and if this area were found to overlap Colombia’s 200 M EEZ entitlement, the question then remains as to whether or not this overlapping area of continental shelf entitlements (seabed and subsoil only) would require delimitation. Or, on the other hand, whether Colombia’s 200 M entitlements would automatically prevail due to the legal nature of the EEZ entitlement. State practice seems to favor the position that extended continental shelf claims are reserved for areas of seabed that fall beyond 200 M from any coastal State’s baselines. 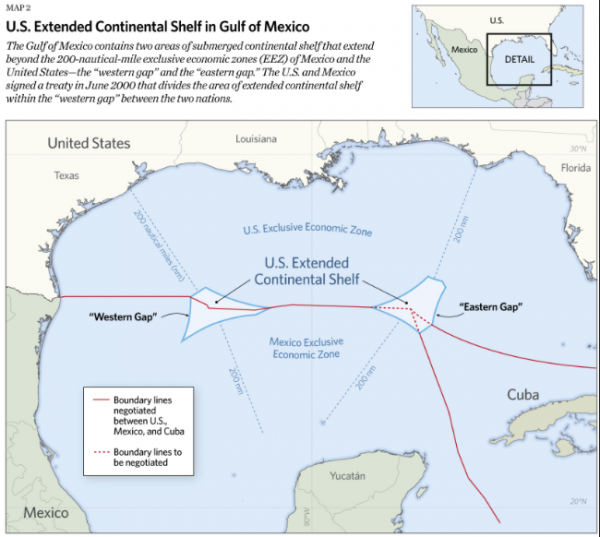 In the general vicinity of the western Caribbean Sea, Mexico, Cuba, and the United States have all made extended continental shelf claims in the Gulf of Mexico. However, those claims have all been limited to the areas known as the “Eastern Gap” and the “Western Gap.” None of the extended continental shelf claims have ventured into the 200 M EEZ of neighboring States. In the North Atlantic, the enclaved French islands of St. Pierre and Miquelon illustrate very clearly this respect of the 200 M EEZ entitlement. 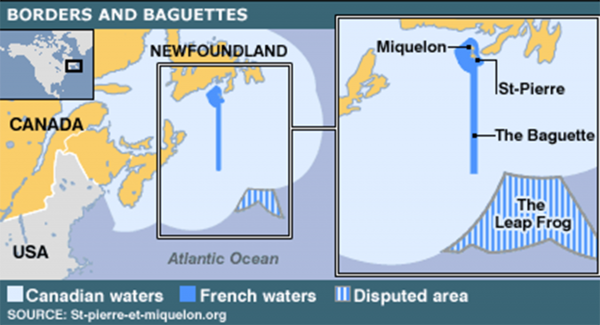 In its consideration of an extended continental shelf claim for these dependent islands, France has recognized that the extended continental shelf in the area south of St. Pierre and Miquelon’s maritime corridor starts beyond Canada’s 200 M EEZ entitlement limit. Their hopes of acquiring a portion of this potentially oil-rich outer continental shelf area would have them making a discontinuous “leap frog” claim over Canada’s 200 M EEZ entitlement, and thus landing in the outer continental shelf beyond any Canadian legal entitlement. It is important to note that the ICJ’s ruling in this case will only impact sovereign rights to the seabed and subsoil, since Nicaragua would have no EEZ entitlement beyond 200 M from its baselines. Therefore, the more seaward location of the San Andres archipelago, which the Court has already ruled are part of Colombia’s sovereign territory, would give Colombia the sovereign rights to the resources found in the shelf’s superjacent waters regardless of which State might be granted the sovereign rights to the continental shelf below.